The Rep's summer break has officially come to an end – thank goodness. Rehearsals have begun for Evita, the blockbuster beginning to our 52nd season. 1.) Casting this show was like assembling a massive puzzle. Andrew Lloyd Webber's score for Evita is brilliantly, and somewhat infamously, complex. It requires an ensemble of actors who can sing in every range – and for the woman playing Evita herself, all of them at once. So it's not surprising to hear from director Rob Ruggiero that the casting process was painstaking, starting in April and spanning well into the summer. Now that Ruggiero and his team have assembled the collection of voices they were looking for, the next step is to gel them into a harmonious unit. "We're only going to be as good as we are all together," Ruggiero said, noting that the ensemble is just as essential to the show as the leads. 2.) If you're producing Evita, it never hurts to have two crazy-talented Argentinians on your team. Show choreographer Gustavo Zajac and costume designer Alejo Vietti are both natives of Buenos Aires. With their deep cultural connections to the material, they're bringing a little something extra to the production. "We're not telling some old history tale," Zajac said. "When you go to Argentina today, the Peronist movement is still alive. They still speak on behalf of Eva Perón. We're telling a very contemporary story." 3.) Eva Perón has many sides to her – and this show hits them all. A unique figure in history, Eva Perón was a political celebrity whose efforts toward women's suffrage and aiding the poor made her akin to a secular saint. But she was also politically ruthless. Tim Rice and Webber's musical is so rich because it explores all the different facets of her character. "It's a pendulum," Ruggiero said. "As an audience member, you understand her, you love her and you should feel for her. But you also see her ambition, her power and ultimately her revenge." 4.) The tango is the heartbeat of the show. In addition to his work on Broadway, Zajac has presented tango concerts and musicals throughout the world – he actually came to Evita's opening day straight from a production of Barnum in Seoul, South Korea. ("I slept for twelve hours" on the flight, Zajac clarified when asked how he was feeling). 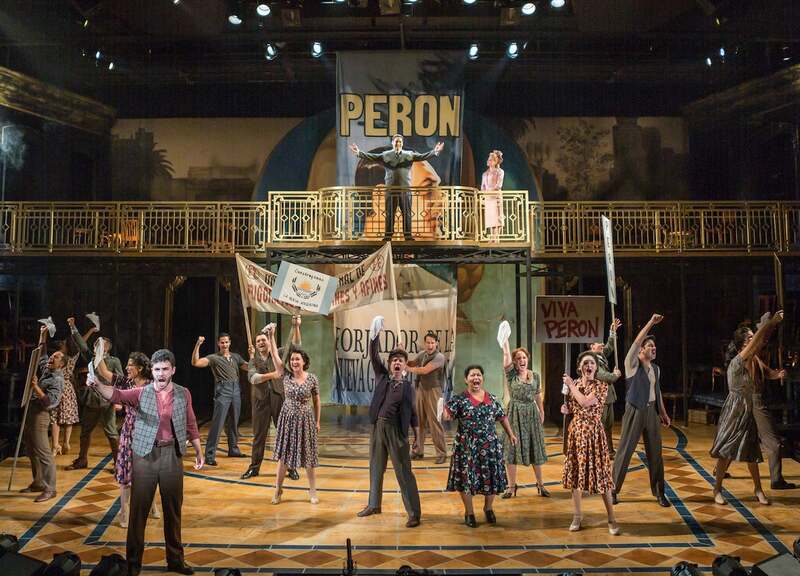 Evita is not simply a tango concert, but that dance's energy and passion form the heartbeat of the show. For the first week of the production, tango consultant Mariana Parma will assist Zajac in helping our cast perfect the art of the dance. 5.) Even Ruggiero's a little intimidated, but he's got backup. Ruggiero is the owner of a ridiculous resume at The Rep and The Muny, where he just helmed an acclaimed production of Gypsy. At our theatre, he's taken on such enormously challenging musicals as Follies, Sunday in the Park with George and Urinetown. And yet, as he admitted in a text to show star Michelle Aravena, this one is especially involved and intimidating. Thankfully, Aravena has his back. Her texted response: "We've got this."